The National Cherry Blossom Festival annually commemorates the 1912 gift to the city of Washington of 3,000 cherry trees from Mayor Yukio Ozaki of Tokyo to enhance the growing friendship between the United States and Japan and celebrate the continued close relationship between our two peoples. In a simple ceremony on March 27, 1912, First Lady Helen Herron Taft and Viscountess Chinda, wife of the Japanese ambassador, planted the first two of these trees on the north bank of the Tidal Basin in West Potomac Park. By 1915 the United States government had responded with a gift of flowering dogwood trees to the people of Japan. In 1927, a group of American school children reenacted the initial planting; the first festival was held in 1935, sponsored by civic groups in the nation's capital. Then one fateful day, this friendship went sour, with the attack on Pearl Harbor. Conflicts arising before WWII escalated to the point that Japan launched the first attack on our native soil since the war of 1812. After being ushered into the war, and after much bloodshed and valor, in the end, the USA and her allies prevailed and the international conflict was won. The Japanese then welcomed their victor onto their soil. Much of modern Japan's current economic success is due to their desire to be like the one who was successful in the war: America and her allies. Three thousand, eight hundred more trees were accepted in 1965 by First Lady, Lady Bird Johnson. In 1981 the cycle of giving came full circle when Japanese horticulturalists came to take cuttings from our trees to replace Yoshino cherry trees in Japan which had been destroyed in a flood. With this return gift, the trees again fulfilled their roles as a symbol and agent of friendship. The most recent event in this cycle occurred in the fall of 1999. It involved the formal planting in the Tidal Basin of a new generation of cuttings from a famous Japanese cherry tree in Gifu province reputed to be over 1500 years old. In 1994 the Festival was expanded to two weeks to accommodate the many activities that happen during the trees blooming. Today the National Cherry Blossom Festival is coordinated by the National Cherry Blossom Festival, Inc., an umbrella organization consisting of representatives of business, civic and governmental organizations. 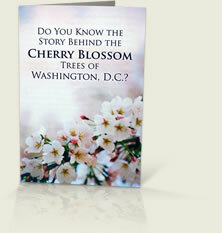 Over a million people visit Washington each year to admire the blossoming cherry trees and participate in the Festival that heralds the beginning of spring in the nation's capital. Cherry blossoms are an annual and elegant reminder of the beauty and brevity of life. 1 The Washington, D.C. cherry blossoms are also a wonderful reminder of the friendship and reconciliation between America and Japan. Do You Long For A Hurtful, Damaged Relationship To Be Reconciled? There is probably not a person alive today who has not experienced hurt and betrayal from a friend at some point in their life. It probably takes you only a moment to bring one to mind.But there is an even more powerful story of friendship, conflict and death, followed by reconciliation. It is not a story from the last hundred years of world history. It a story that spans thousands of years. It is the story of love and sacrifice greater than any ever seen. It is the story of Jesus Christ. Would you have a few minutes for me to share some of the details about that story of reconciliation? But the Giver of life loved His creation so much that before the beginning of time, He planned a redemption. If you pray this prayer for yourself, we would love to know. If you have questions, we would love to know also! We are working on a web site that may answer some questions, www.GetEternalAnswers.org.